OK, so I’ve been AWOL for a while, mostly because the real world has had me doing work. So no new Flash games? No updates on Scrambled? Again, the real world has hampered my time to develop things. 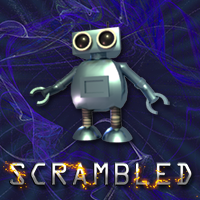 Scrambled has fallen on the back burner due to a somewhat negative response from developers who felt that it was too similar to LightBot. Although it uses the same “programming” mechanism I feel that the style of puzzles in Scrambled is very different, and such criticism wouldn’t have been levelled at it if it weren’t based on such an original game. In the mean time, it’s available exclusively here, for your enjoyment. If you like the game, or would like to see it distributed feel free to send me feedback. You can read about it in more detail in my last post here. Are you stuck? Is it worth me posting the hints section? I acknowledge that it is a very challenging game and is possibly too hard for non-coders. It also requires a lot of perseverence to progress through all the stages. My next submission will require less brain work, and have a little humour or quirkiness hopefully. I’ve had a few projects in the back of my mind, one pixel style isometric Flash game, the other using Unity 3D. I’ve already created some very cool sprites for the isometric game, and a rather cool 3D animated character for the Unity project. I won’t divulge too much yet, but hopefully I’ll find some time to post more progress soon. The beta version of my new Flash game Scrambled is now online. They say “the Devil is in the details”, or should that be “God is in the details”? It probably depends on whether you’re a glass half full or half empty kinda person… people who know me would say I’m the latter, and with the amount of time these details have been consuming, I’d say it’s the devil’s work. Some thoughts on external assets in flash web games. I’m getting close to finishing porting the first of many games to Flash and ActionScript 3.0 and I’m rapidly discovering that years of computer science wisdom don’t apply in the flash game development and publishing world.